...its satellite broadband service, SES Broadband, in Ka-band in November 2012. The new service will offer download speeds of up to 20Mbit/s and upload speeds of up to 2Mbit/s. It will be marketed via SES’ long-term partners NordNet, Vivéole and WIBOX to end-consumers in France. 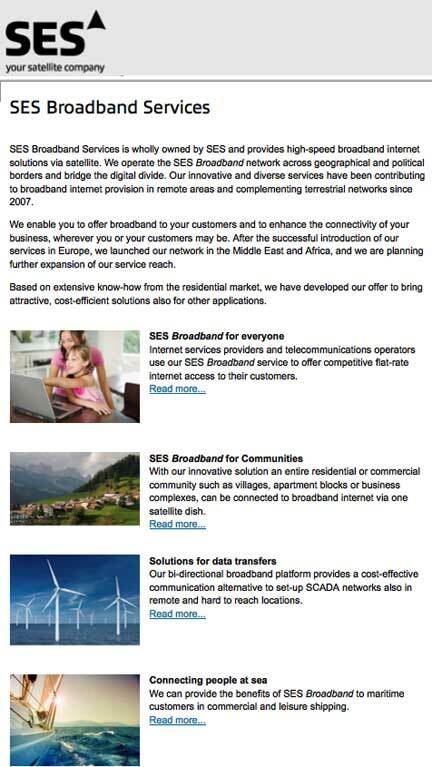 SES Broadband in Ka-band will be available pending the launch and beginning of operations of SES’ ASTRA 2F satellite. The satellite is currently scheduled for launch on September 21, 2012 and will be located at the orbital position 28.2 degrees East.